Come rain or shine, Liverpool are hanging on in there in the race for the Premier League title. Buffeted by strong winds and peppered by hailstones, the conditions arguably played into the hands of Burnley’s robust starting eleven on Sunday, and when the Clarets took the lead at Anfield with a dubious goal – surely James Tarkowski fouled Alisson from the corner? – there was a pensive feeling on the terraces. But the Reds stuck to their task and when Tom Heaton spilled Mo Salah’s cross into the path of Bobby Firmino, the scoreline was levelled. Any concerns of more dropped points were allayed somewhat when disarray in the Burnley defence saw the ball fall to Sadio Mane, who curled home a delicious finish. It stayed that way until the half-time, and with the weather allaying somewhat during the break Jurgen Klopp’s men were able to stamp their authority on proceedings during the second period. Heaton was again at fault for Liverpool’s third goal, sending a wayward goal kick straight to the feet of Salah, who piled forward before the ball fell to Firmino, who once again had the simple task of tapping into an empty net. There were other chances, with Mane hitting the bar from about two yards out, and nerves were frayed somewhat when Burnley reduced the deficit to one in injury time. But as the Clarets pushed forward looking for an equaliser, that left gaps for Liverpool to penetrate on the counter attack, and one such raid saw Mane bag his second, and Liverpool’s fourth, to secure the points. Playing on the break may just be the order of the day in Wednesday’s Champions League last 16 clash with Bayern Munich, who after a tough first half of the 2018/19 campaign are now flying. Any trip to the Allianz Arena is a tough one, but all it could take is for us to poach an away goal and we’ll be in the driving seat. There are a couple of injury problems for Klopp to solve. Trent Alexander-Arnold was substituted after 86 minutes on Sunday, and while it was only thought to be a precaution the right back did complain of some muscle stiffness. Otherwise, Klopp has a full hand to play with. 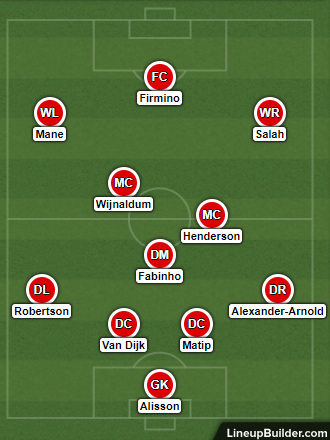 He will play his strongest available starting eleven, with that double-defensive midfield pairing – presumably Fabinho and Jordan Henderson – joined in midfield by the energetic Gini Wijnaldum. It would be fair to say that Bayern Munich haven’t been their all-conquering selves in the German Bundesliga, but they have recently returned to the summit of the table after a five-match winning run. That includes their most recent results – a 5-1 triumph over Borussia Monchengladbach and a 6-0 victory over Wolfsburg, so clearly the mojo of Niko Kovac’s men has returned. In their Champions League group they were unbeaten (W4 D2 L0), and on home soil they enjoyed a 5-1 hammering of Benfica backed by a 2-0 win against AEK Athens and a 1-1 draw with Ajax. With Bayern finding a bit of form of late, and boasting an extraordinary home record in the Champions League of W21 D2 L2, this is clearly a tough assignment for Liverpool on Wednesday. You can see why the hosts are favourites with the bookmakers then; marking one of the very few occasions that the Reds have been the underdog in a fixture this term. Interestingly, of those four games Bayern haven’t won on home soil in this competition, three have come in the past calendar year: the stalemate with Ajax backed by a draw with Sevilla and defeat to Real Madrid. So, perhaps, a case could be made that their air of invincibility in front of their own supporters has come to an end. Could Liverpool extend that run yet further? It’s certainly plausible, and a price of 5/6 on the Reds with a +0.50 Asian handicap – our wager lands if they win or draw – certainly looks fair. A Bayern Munich goal doesn’t necessarily change this tie; we’d still go through by netting an away goal of our own. But if Liverpool score first it blows the contest apart, so expect a more circumspect performance from the Germans than normal. As such, this is more likely to be a slow-burner, and Under 2.5 Goals, at 21/20, looks a generous price.